Although the Microsoft Band 2 bears a recommended price tag of $250, Microsoft appears to be committed to offering its current-gen fitness tracker at a lower price. Between February and late March, the Band 2 was priced at $175 at both the Microsoft Store and Best Buy, and now the promotion is back for a second run. Starting today and lasting until May 21st, the Microsoft Band 2 can be purchased at a price of $174.99 from Microsoft or BestBuy. Again, that's down from a standard price of $250, and a very good price for one of the most competitive fitness band on the market. 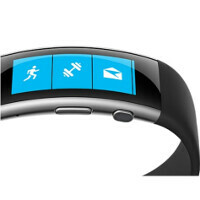 The second-generation Microsoft Band is one of the most appreciated fitness trackers currently available on the market. The highlights include a full-color curved OLED display, GPS, UV monitoring, calorie and sleep tracking, a heart rate sensor, and a barometer for keeping tabs on changes in elevation. On the software side, the band also comes with smart notifications and guided workouts. The Microsoft Band 2 is compatible with Windows Phone, iOS, and Android, although Cortana integration is, unfortunately, available only when the band is paired with a Windows Phone device. The Microsoft Band 2 comes in three sizes: a small one for wrists that measure between 5.7 and 6.5 inches, a medium one for those with a wrist size between 6.3 and 7.5 inches, and a large size that's suited for those with wrists that measure between 7.3 and 8.5 inches. Naturally, you should make sure that you get the proper size for your wrist. What do you guys think of this price? Is the Microsoft Band 2 worth buying at $175? Got one last night. I'm impressed with the features and integration with all 3 major OSes.